Assesses and explains the emergence of Sunni jihadist organisations in Syria's fledgling insurgency, charts their evolution and situates them within the global Islamist project. External factors in their emergence are scrutinized, including the strategic and tactical lessons learned from other jihadist conflict zones and the complex interplay between Al-Qaeda and IS. 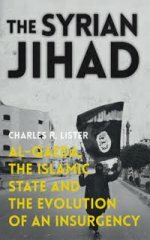 Charles R. Lister is Resident Fellow at the Middle East Institute in Washington DC. Previously, he was a visiting fellow at the Brookings Institution’s Doha Center, and head of the Middle East and North Africa section at IHS Jane’s Terrorism and Insurgency Centre.